1. In food processor, combine all ingredients except olive oil. Pulse 15 seconds. Slowly add olive oil and pulse until well combined. 2. Rub both sides of salmon filets before grilling. 1. In a large saute pan over medium heat add olive oil and heat until shimmering. Add onion, carrot, celery, leek and garlic and cook until caramelized about 20-30 minutes. 2. Add tomato paste, thyme, oregano and chorizo until the sauce takes on a deep, rusty color; about 20 minutes. Add white wine to deglaze pan. Add San Marzano tomatoes. 3. Reduce heat to low and let sauce cook down slowly for 2 hours until rich and thick. 4. Add cooked pasta to sauce and stir to combine. Add parmesan cheese and stir to combine. 5. 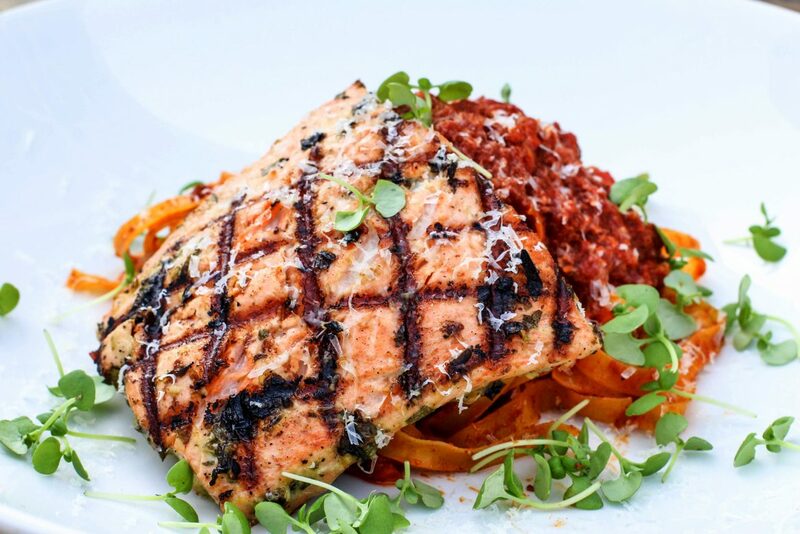 To serve place grilled salmon on center of plate and add a generous scoop of chorizo bolognese. Top with micro basil.